Making change for the better takes place locally, so starting right now, we’ll be planning events to provide YOU with easy ways to help others. Plan on attending…donating…and maybe even sponsoring events that will make 2017 great! We’re doing a food drive to help East Orange/Orange Community Development Corporation. Let us know how you’d like to get involved by shooting us a quick email! We’re happy to drop off a bag that you can fill with food. 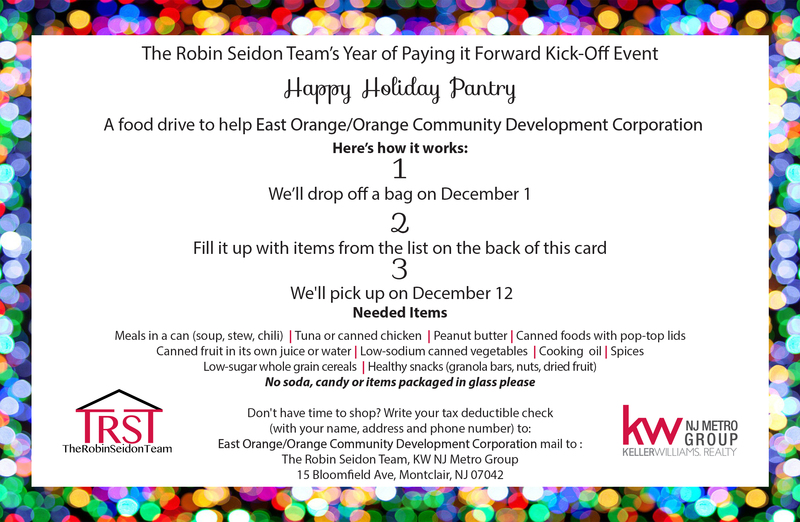 Or, participate by writing a check to East Orange/Orange Community Development Corporation and sending it to The Robin Seidon Team KW NJMG, 15 Bloomfield Avenue, Montclair, NJ 07042.